SOUTHAMPTON, PA, USA, March 14, 2014 – Aircrew Training Systems (“ATS”), a division of Environmental Tectonics Corporation (OTC Pink: ETCC) (“ETC” or the “Company”), announced today that it was selected by the U.S. Army Contracting Command to provide the Colombian Air Force (“FAC”) with a spatial disorientation flight simulator following a competitive bidding process. The GYRO IPT II (Integrated Physiological Trainer) will help FAC pilots to recognize in-flight conditions that contribute to spatial disorientation and how to fly to a successful resolution. The new system will be installed at the FAC Aerospace Medicine Center (CEMAE) in Bogotá, Colombia next spring. ETC’s GYRO IPT II provides pilots with a hands-on realistic, full motion, spatial disorientation flight training experience. While in control of a simulated flight, the pilot can be exposed to a variety of selected disorienting illusions. Unlike simple disorientation demonstrators, a pilot in the GYRO IPT II has full closed loop control of the simulation before, during and after the illusion. 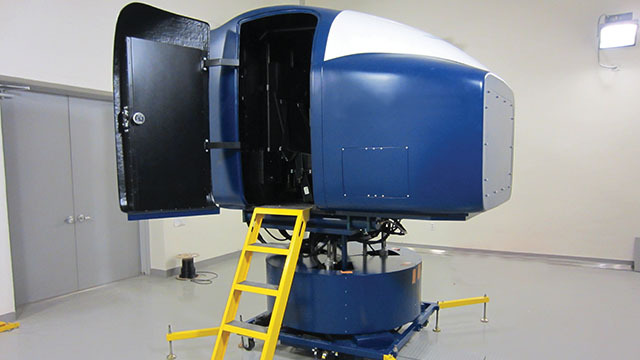 This capability creates a fully interactive flight training environment where the pilot must maintain control of the simulator and fly through the illusion to a successful resolution during training. The new GYRO IPT II will complement the suite of training devices already operating at CEMAE. The facility is also home to an Altitude Chamber, Night Vision Training System and Vestibular Illusion Demonstrator, all previously provided by ETC.